We were previously honoured to get a chance to check out Osprey’s stunning Tropos 32 Backpack earlier on this year. A rucksack which clearly stood out from the crowd not just with it’s range of features but also it’s simply gorgeous aesthetic. So when the opportunity arose to cover their latest piece of luggage, the simply fantastic looking ‘Osprey Rolling Transporter 40’ we simply couldn’t refuse! As with all Osprey cases, the Rolling Transporter 40 looks absolutely stunning with it’s strong and durable outer TPU laminated nylon. 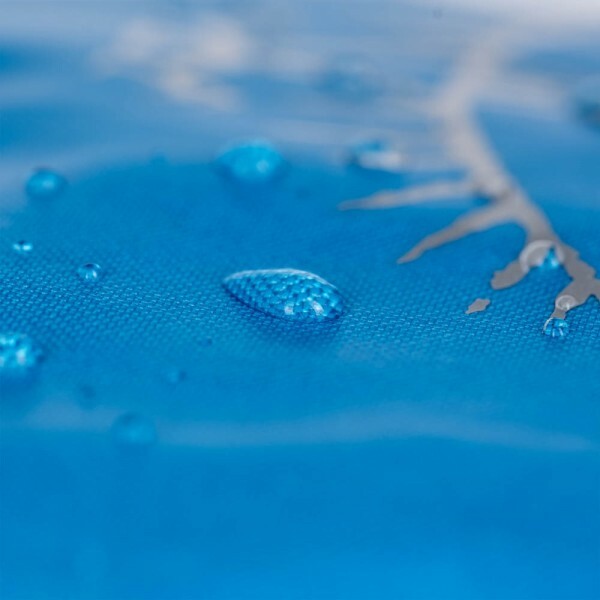 It has to be said the material itself feels a lot more robust than other similar travel bags, with a clearly waterproof finish. This is real piece of mind for the traveller as it’s evident that no water or rain is going to permeate through this tough outer casing. Not to mention it’s going to remain resistant to potential sharp objects for tearing or ripping so you know in transit this pack will be able to take a real punishing without any worries about damage. The Rolling Transporter 40 also comes in three attractive colours. Kingfisher Blue, Black and Ruffian Red – each looks fantastic and offers the user a means of customising their bag to suit their own personal style. 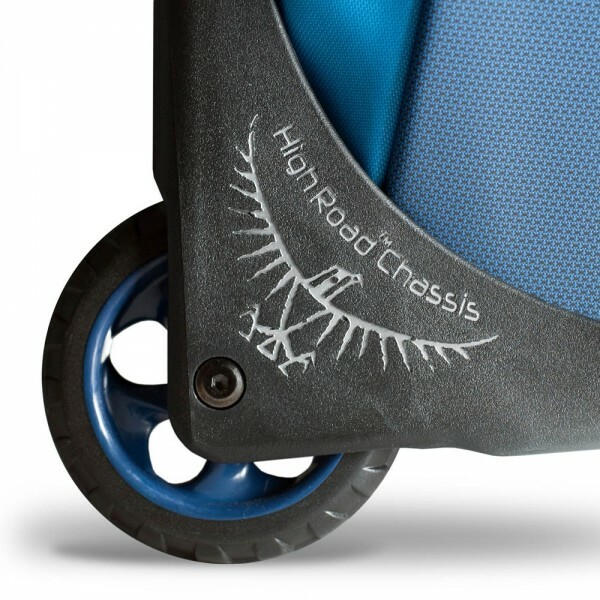 What really made the pack stand out was it’s incredible Osprey HighRoad chassis. This sturdy base for the pack is said to allow it to go where similar packs might not be able to cope. 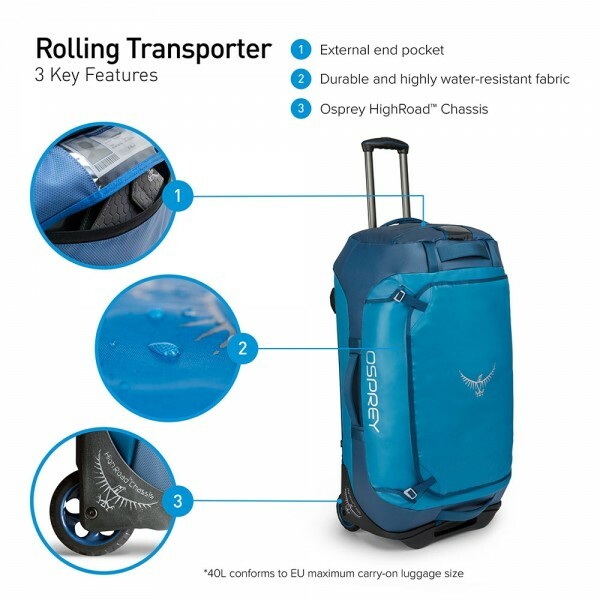 Accompanied with the epic looking polyurethane all-terrain wheels which look like they were built for shredding through muddy paths rather than your standard meek slimline wheels on most other rolling luggage and you know you’ve got a pack which is something very special indeed. These wheels will ensure your luggage is kept rolling through the most adverse of conditions when the terrain or weather is doing it’s best to stop you. To make things easier rolling we also particularly loved the ErgoGrip handle which provides a smooth and easily retractable means of pulling your luggage with you whilst on the move. The grip is remarkably comfortable and really made pulling the pack all the more easier especially when you’ve heavily packed it! Also, the pack’s barrel-like design really helps with being able to pack as much luggage in as possible. That’s not to say space is an issue though with an impressive 55cm (long) x 36 cm (wide x 23cm (deep) there’s ample space to pack your stuff. 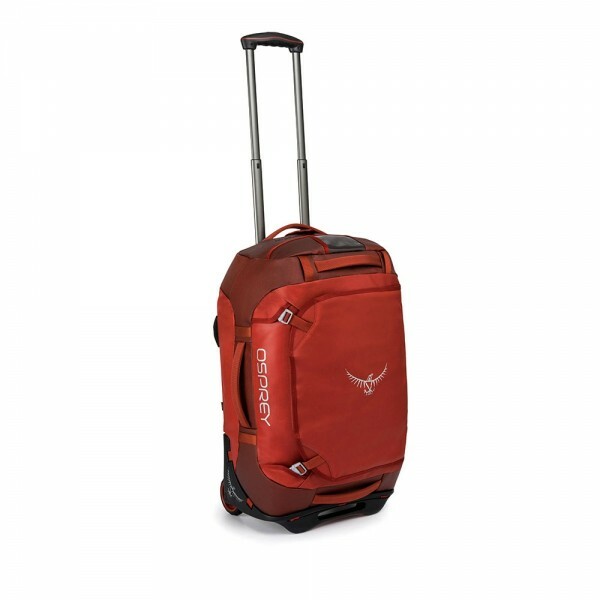 Osprey have also given consideration towards packing as much as possible with large easy access pocket, ideal for passport and travel documents. Not to mention mesh pockets for essential gear you want to keep safely stored in one place. We particularly loved how the main easy access pocket opens easily to the side which made it even easier to pack items in a duffel-like way. It should also be mentioned that the internal space of the bag is assisted by straps which help keep your belongings tightly secured and in place. Something which is really handy when you’ve got a lot to take with you! But should that be the case you don’t have to worry about issues getting on a plane with the Rolling Transporter 40. What was also great to know is that the bag conforms to most EU maximum Carry-On luggage sizes so you can rest assured you won’t have to worry about issues getting this through check in points when you’re in a hurry.